Allan V. Horstmann, 17 of Breese and formerly of Aviston and New Baden, died Sunday, May 23, 2010 in East Fork Township, Clinton County, IL. 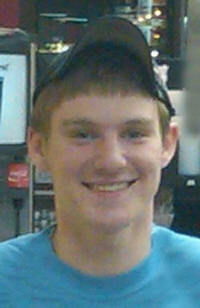 Allan was born February 11, 1993 in Breese, IL to Michael and Cheryl “Cheri” (Voss) Horstmann; they survive in Breese, IL. Also surviving are his siblings, PFC Paul Horstmann, Mackenzie Horstmann, Caleb Horstmann, and Alexander Horstmann all of Breese; his maternal grandmother, Bertha (Laux) Voss of Breese; aunts and uncles, Michael (Carol) Voss of Beckemeyer, Diane Fewell of Carlyle, Ronald (Diane) Voss of Breese, Karen (Larry) Crouch of Normal, Deborah (John) Will of Swansea, Darlene (Barry) May of Altamont, Colleen (James) Lozier of Pocahontas, Maurice “Mo” Voss of Breese, Constance “Connie” (Kevin) Heimann of New Baden, Lisa Voss of Mesquite, TX, Daryl “Sarge” Voss of Breese, Stacey (Mark) Anders of Sullivan, Dan (Rachelle) Horstmann of Breese, Debbie (Michael) Berndsen of Breese, Brenda (Charles) Scott of O’Fallon, Sheila (Matt) Clair of Collinsville, and Sandra Horstmann of Belleville; his very special friend, Kate Hilmes of Carlyle; his best friend, Joey Krebs of Breese; and numerous great aunts and uncles, cousins, and friends. He was preceded in death by his maternal grandfather, Vincent “Vinnie” Voss; paternal grandparents, Paul and Dolores (Hemann) Horstmann; great-grandparents, Eugene and Dorothy (Schumacher) Horstmann; and an uncle, Doug Voss. He was a member of St. Francis Church in Aviston and had recently completed his sophomore year at Mater Dei High School in Breese. His passion was repairing engines and welding and was known as his dad’s “Fix it Man”. Funeral Mass of Christian Burial will be Thursday, May 27, 2010 at 10:30 am at St. Francis Church in Aviston with Fr. Daniel Friedman officiating. Interment will follow in St. Francis Cemetery, Aviston. Visitation will be Wednesday, May 26, 2010 from 4:00-9:00 pm and again on Thursday, May 27, 2010 from 8:00-10:00 am at the Moss Funeral Home in Breese. Memorials can be made to Mater Dei High School and will be received at the funeral home.